Thank you for this comments and because of that I have changed my ‘About me’ link at the side bar, so that everyone can see a Terella! Can you really see the northern light from everywhere in Norway? Isn’t it just in the north as it is in Sweden? We didn’t see it when we were in Iceland, because we were there in June and the best time to see it there is in the autumn, late September as Cath says. You can, but very seldom, see it in the south part as well, but it has to be in the clear late, fall night. I have never seen it very clear either. Thank you for your comment on my site. I would like to wish you, your family a Merry Christmas and a prosperous Happy New Year with Peace, Love and Joy. Your welcome – I liked your blog and thanks for returning the favour. Its always great to welcome new visitors you know! I wish you a nice and happy one too and welcome back! Hello Renny BA. It was quite an experience for me being here. 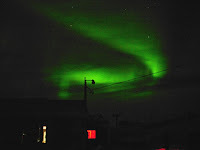 The Northern Lights is indeed one of the amazing phenomenas. Wow! Thanks for stopping by – always great to see new readers and glad you found some of interest! The attacks on our magnetic shield from recent sun and deep space supernova explosions may change the life on earth by 2012. Renny, thank you for all of your wonderful information! My son has been living in Bergen for 4 months and has absolutely loved it! He is being moved to Narvik in the middle of the month and I was worried about how cold it would get, clothing he might need, etc. Your information has been so helpful! Thank you! !